This Saturday, Feb. 20, during the basketball game against Notre Dame social sorority Alpha Xi Delta will be celebrating Coaches Powering Forward along with all those in attendance. Coaches Powering for Autism was co-founded back in 2014 by Tech’s assistant basketball coach Tom Herrion alongside another National Collegiate Athletic Association (NCAA) coach Pat Skerry, who serves as the head basketball coach for Townsen University. Both coaches are fathers to sons who were diagnosed with autism. The mission of the project is to raise awareness for autism and its related disorders. The whole initiative was started in conjunction with advocacy group Autism Speaks. Autism Speaks is a leading autism science and advocacy organization which funds research on the causes and prevention of autism as well as finding methods for early diagnosis. Autism Speaks has also nationally partnered with Alpha Xi Delta, whose main focus across the country is to work with the advocacy group to raise awareness and fundraising and have raised millions of dollars already. That inaugural year, Herrion and Skerry asked their fellow coaches to simply wear the Autism Speaks blue puzzle piece pin during the televised games in the first weekend of February to help raise awareness for the disorder impacting their, and many other, children and families; more than 82 NCAA coaches and broadcasters participated that year. The following year, more than 250 coaches and staff participated. Over 60 schools raised an average of $6,800 per school for children diagnosed within the spectrum. Coaches Powering for Autism is hoping to recreate their success this year. “Our event is so important in our attempt to educate people about autism and the impact it has,” said Herrion in a press release by sorority Alpha Xi Delta. Many in attendance this Saturday will be wearing light blue colored shirts and the Autism Speaks puzzle piece pin and showing in support for the coaches’ initiative and raise awareness. The sisters of Alpha Xi Delta will all be attending the game and plan on handing out stickers before the game starts by the student entrance of McCamish Pavillion. 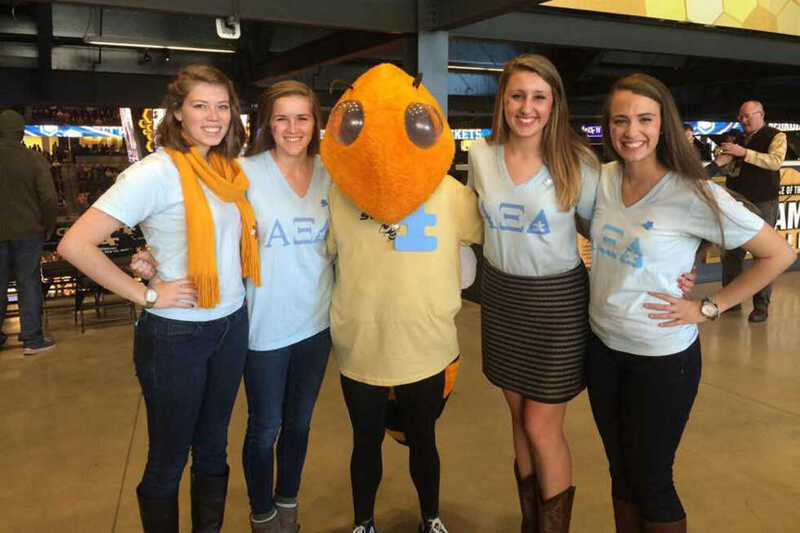 “The idea behind this event is to raise as much attention and awareness as we can by getting mascots wearing puzzle pieces and the game patrons to be in the color of Autism Speaks, which is light blue,” said Paloma Zavala, third-year INTA and publicity chair of Tech’s chapter of Alpha Xi Delta. The terms “Autism” and “Autism Spectrum Disorder,” as defined on the Autism Speaks website, are general terms describing a range of complex brain disorders which are characterized by difficulties with social interaction, verbal and nonverbal communication as well as repetitive behaviors. The most obvious symptoms of the disorder tend to appear between the ages of two and three, thus increasing awareness is crucial in facilitating early intervention and therapy. Approximately 1 in 68 children in the country are on the spectrum. Although this basketball game is not a Coaches Powering Forward fundraising event, many including sisters from Alpha Delta Xi, will be wearing light blue and puzzle piece pins to help raise awareness for and understanding of autism. The game will take place Feb. 20 at 8 p.m.